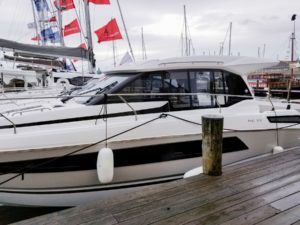 The Jeanneau Leader 36 is a trailblazer in the inboard powerboat category. 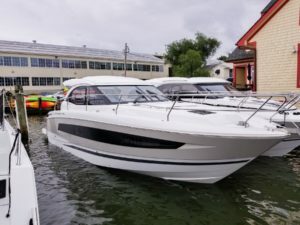 Upon its introduction, it won the Best of Boats International Award (2015) and was a finalist for the Motor Boat Awards (2016). With a timeless, sporty design and exceptional interior layout, the Leader 36 provides easy handling and comforts fit for family cruising. Sportiness and elegance have never before been combined so perfectly. The Jeanneau NC 33 undeniably represents the NC line’s philosophy of experiencing life on the sea. With a hull masterfully designed by Michael Peters, this clever inboard powerboat offers top-quality technology, meticulously crafted comforts, and safety at sea. Wide, recessed sidedecks facilitate easy movement around the boat. Our President and Managing Partner, Chris Bent, will be available throughout the show to personally answer your questions about the Business Yacht Ownership® program. Join us for a live seminar on Dock C to learn how it is possible to offset 80-100% of new yacht costs. Alternatively, you can watch a webinar about the program and come to our tent with your questions ready. Don’t forget to follow us on Facebook and Instagram for United States Powerboat Show reminders and updates!